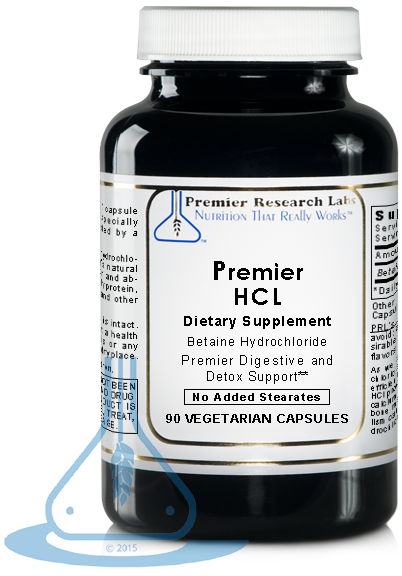 Premier HCL features betaine hydrochloride which assists the body’s natural stomach acids in the digestion and absorption of nutrients, especially protein, vitamin B12, calcium, iron and other minerals.† †Results may vary. As we age, we typically produce less hydrochloric acid (HCl) which reduces our ability to efficiently absorb nutrients from food. Reduced HCl production affects the amount of protein and calcium we can absorb and can interfere with bone metabolism. Incomplete protein metabolism can imbalance intestinal flora. 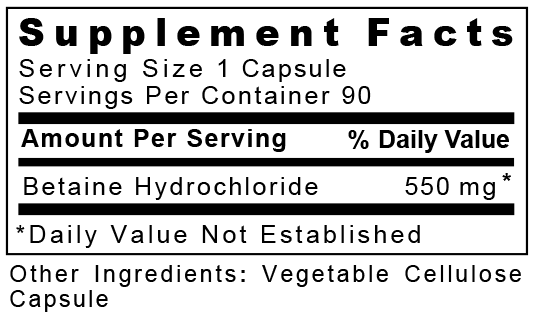 ne hydrochloride promotes absorption of nutrients. ne hydrochloride (HCL) is an acidic form of ne that has been recommended by health practitioners as an effective supplemental source of hydrochloric acid especially for those that suffer from hypochlorhydria. control the amount of bad bacteria and harmful organisms ingested through contaminated food and water. Powerful digestive aid for people who may have been privy to a poor diet, prolonged dehydration and generalized stress. Shown to offer digestive support to perimenopausal women and elderly individuals. Beneficial in treating hypochlorhydria, a deficiency of stomach acid production. Crucial compound in balancing homocysteine levels, a condition related to severe heart disease. ne HCL levels decrease as we age. This can lead to sluggish digestion and poor mineral and nutrient absorption. Low ne HCL levels means that the body is not detoxifying itself in an optimal fashion. Many people facing poor digestion have found that taking a vegetarian form of plant derived ne HCL before meals aids them in their own digestive process, as well as metabolizing the food they consume. Does Not Contain: toxic tablets, glues, fillers, binders or excipients of any kind. This product is vegan and excipient-free. Pregnancy - If pregnant or nursing, consult with your healthcare practitioner before taking ne hydrochloride. Sugimoto K, Makihara T, Saito A, Ohishi N, Nagase T, Takai D. ne improved restriction digestion. Biochem Biophys Res Commun. 2005 Dec 2;337(4):1027-9. Epub 2005 Oct 3. 5 Common Intestinal Parasites in Humans. Parasite Cleanse Resource Center. 2009 June 10.